Con Edison has introduced a tool that lets residential customers get quick, customized information on the financial benefits they’ll get by installing solar panels. The new feature on the Con Edison Marketplace will even manage the buying process for a customer who chooses solar. A purchase takes place only after contractors submit competitive bids, ensuring that the customer gets the best possible price. The process starts with the customer going to the Marketplace and entering an address and approximate monthly electric bill. The site will provide details on the amount of money the customer would save with solar, the potential increase in the value of the customer’s home, and financing options. The customer will also learn the size of the solar array the home would need and the amount of carbon emissions the panels would prevent. The feature is consistent with the goals of the Reforming the Energy Vision proceeding, which is New York State’s initiative to make it easy for customers to get solar and other forms of clean energy. 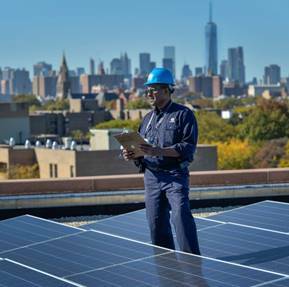 It is Con Edison’s latest initiative to increase the amount of solar energy in New York City and Westchester County, N.Y. The efforts have worked, as Con Edison customers have completed 17,000 projects that produce more than 170 megawatts of power without burning fossil fuels. The Marketplace – powered by Los Angeles-based Enervee – began in 2016 as an online resource where Con Edison customers can review and buy smart thermostats, LED lighting, appliances and dozens of other products that help them save energy. The Marketplace has generated 1.5 million page views in 2017. During a recent promotion, the Marketplace produced sales of more than 61,000 products, including 2,600 smart thermostats. Con Edison and Enervee have partnered with Pick My Solar, which is also based in Los Angeles, to manage the solar sales process from bidding and contracting all the way to installation for Con Edison customers who buy solar systems through the Marketplace. The partnership has already produced results. Hundreds of customers have received customized analysis of their roofs’ suitability for solar and some customers have already purchased their solar systems through the Marketplace.